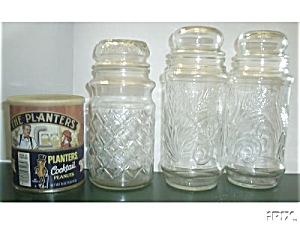 4 OLD PLANTER`S PEANUT 3-JARS 1-TIN. TIN SAYS PLANTER`S NOSTALGIA CAN LIMITED EDITION. ORIGINAL PAPER STICKER STILL ON CAN. CAN IS RUSTING FROM THE INSIDE OUT. 3 PLANTERS JARS 1 PINEAPPLE CUT DESIGN???? ON THE BOTTOM SAYS 1984 WITH A (B) IN A CIRCLE AND NUMBERS 3 7. 2 OTHER PLANTER`S JAR ARE THE SAME FLORAL DESIGN 1982 WITH AN ANCHOR IN A BOX 2 24. THE OTHER FLORAL DESIGN HAS THESE NUMBERS 1982 5 7. NO CHIPS OR CRACKS. NEED A LITTLE CLEANING. PERSONAL CHECKS TAKE 10 DAYS TO SHIP. BUYER PAYS 6 LBS. SHIPPED INSURED FROM 136. PAYMENT DUE IN 10 DAYS.